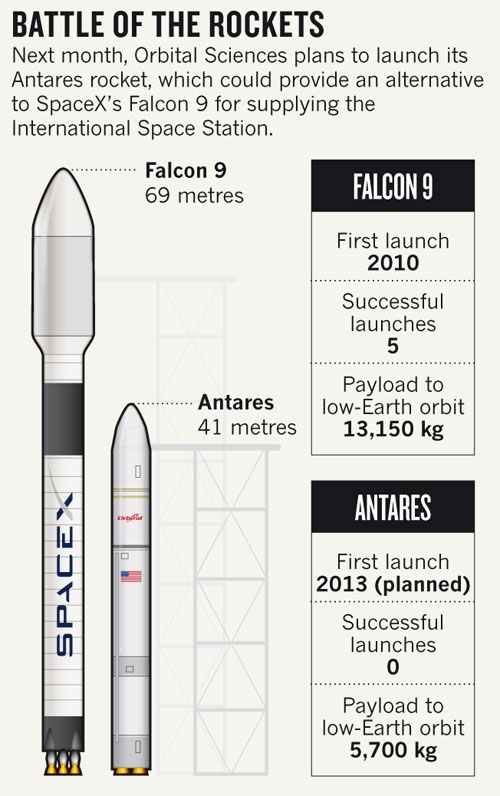 Antares test could challenge dominance of Falcon 9 rocket. The Falcon 9 rocket, which made its fifth successful flight on 1 March, has stolen the spotlight in the commercial space race. Built by SpaceX, a young company based in Hawthorne, California, the rocket has become NASA’s choice for hauling cargo to the International Space Station (ISS). But it may soon have competition from a rocket that has kept a low profile (see ‘Battle of the rockets’). Both companies have received hundreds of millions of dollars from NASA’s Commercial Orbital Transportation Services (COTS) programme. With the space shuttle retiring in 2011, the agency wanted alternatives to paying for ISS deliveries aboard the Russian Progress and Soyuz craft. NASA deliberately put two companies in competition with each other to keep prices down over the long run and to attract other customers. “The government is the necessary anchor tenant for commercial cargo, but it’s not sufficient to build a new economic ecosystem,” says Scott Hubbard, an aeronautics researcher at Stanford University in California and former director of NASA’s Ames Research Center in Moffett Field, California. Read more: Commercial space race heats up : Nature News & Comment.